Social media is a popular marketing channel for small businesses. 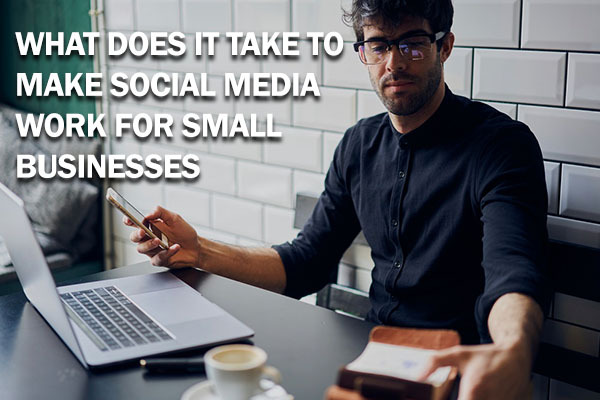 According to a recent survey of small business owners, 80% of respondents used Facebook regularly for marketing and advertising purposes and 51% used Twitter. In this same survey, 38% of respondents named Facebook as their most successful marketing channel, while 29% named Facebook as their least successful marketing channel. The stats above are in line with what we are seeing in Canada. Social media works well for some businesses, but it is not the magic sales bullet for everyone, especially when it's not done right. No doubt there are many benefits to doing social media, including being free and easy to use. It also offers businesses the opportunity to reach the millions of active using them, whether it be Facebook, Instagram, Twitter, etc. Unfortunately, while there is no cost for a small business to create a Facebook Page or tweet about an upcoming event, it doesn't automatically mean your post will be seen by the people who are potential users of your product or service. And even if you get a lot of likes to a specific post, this may not translate into more online sales for your business. It's no wonder we often get asked by business owners about whether social media works, and whether they should spend any time on it. Before spending hours and hours on social media, be clear what you are trying to achieve by being on social media. If what you want are bragging rights that your Facebook page has thousands of followers, then focus on getting Likes to your page. But if your goal is to increase sales from your website, then the main question to ask is, "Are you reaching your target audience, and/or reaching those who may be able to influence your target audience?" We have noticed that there are many fake social media accounts, as well as automated bots, that are doing the "liking" and commenting on posts. If you are a local landscaping contractor, you may get likes for your new water garden from as far away as Timbuktu, but chances are that's not going to translate into any sale for your company in the foreseeable future. A quick check with the analytics from your social media account can help answer this question. We do believe that small businesses can benefit from social media. Most social media networks have made it very easy for business owners to update their accounts, especially when compared to updating their websites, so if your customers are on specific networks, it allows them to be kept informed on what's happening with your business without leaving the platform they hang out in. Social media also gives you the ability to reach potential new customers on their network, as well as connect with your community. It could also help your website's SEO as a ranking signal and potential backlink for your own content. Having a mobile-friendly website and landing page(s), given than most social media is consumed on mobile. Having the relevant messaging and call-to-action to convert your social media traffic. Collecting and showing off reviews and testimonials from happy customers to help influence your social media audience. Implementing a process to collect and grow your own email list. This allows you to remarket to your list on social media, and even expand your audience by using social media's ability to find similar audiences on their network. If you are selling a complex product or service, having supplemental content accessible to prospects to help them through the various stages of the buying cycle. Having the analytics and reporting tools in place to learn what's working and what's not from your social media efforts. Social media works when you are able to find the best audience for your business – to find your niche, you will need a focused effort, and it may require a lot of trial and error. You may also discover that there may be other more effective marketing channels for your business, such as PR or search marketing, so don't rule them out. If you're unsure whether social media is right for your business, we're happy to talk to you about the process we use to help you get the most of your social media efforts.